August 2000. In their three-year run to date, the Eighth Doctor Adventures have failed to settle on a particular style or approach. In Alien Bodies, Lawrence Miles came up with a genius idea, but because the BBC wasn’t cultivating its pool of writers, no-one really picked up on it for another year. Then, when authors did start experimenting with Miles’ new mythology he was publicly dismissive of their efforts, seriously undermining attempts to build a Virgin-style creative community. It didn’t help that range editor Stephen Cole commissioned a linked series of novels that were meant to lead up to the Time War: the kind of tight, plot-driven ‘arc’ that Virgin had abandoned pretty much after the Timewyrm sequence in favour of looser, thematic ‘cycles’. It became harder to dip in and out of the range: you had to read all or nothing. As all this is happening, Big Finish has launched its own range of Doctor Who stories featuring past Doctors. In an environment where fans have to pay for their Doctor Who, each CD cost about the same as buying both the monthly eighth and past Doctor books. The comic strip, slotted away in a £3.30 DWM, was never likely to be direct competition for fans’ cash. The audios are. Plus, the BBC has started to reissue the series on the new DVD format. Suddenly, the books’ future seems less secure. And then Big Finish drops the bombshell: Paul McGann has agreed to appear in a new series of eighth Doctor audios which started recording in May 2000. This is the context behind The Burning, the big re-launch of the Eighth Doctor Adventures written by their new editor, Justin Richards. 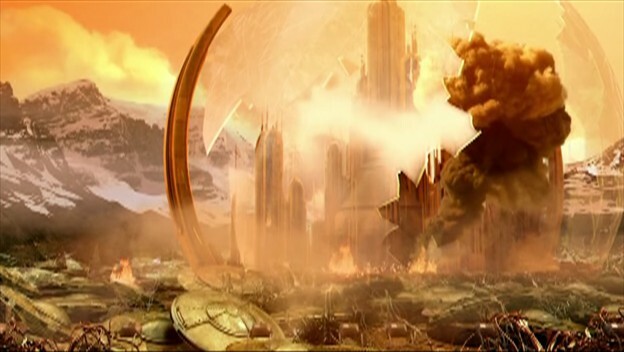 In the previous novel, The Ancestor Cell, outgoing editor Stephen Cole and co-writer Peter Anghelides wrapped up the ongoing Time War mythology by basically blowing it all up, exploding Gallifrey, exterminating the Time Lords and wiping the eighth Doctor’s memory: as clear a case of ‘taking the nuclear option’ as you can get in TV tie-in fiction. Bidding farewell to all that, and consigning practically every element of the first 50 per cent of the Eighth Doctor Adventures series to the dustbin of history (the one exception being companion Fitz Kreiner, who most people thought had worked out reasonably well), The Ancestor Cell was a decisive full stop. When Doctor Who finally returned in 2005 with a Doctor who is the last of the Time Lords, the sole survivor of a fallen planet, fans who’d stuck with the Eighth Doctor Adventures through the ‘Wilderness Years’ were quick to point out the books did that first. In reality, there’s not much comparison. Davies’ destruction of Gallifrey is a horrific event the Doctor is fleeing from, that haunts him, informs his character and creates a suitably dramatic mythology for the new show to drip-feed. In the novels, Gallifrey falls as a convenient way for the books to try to win a new audience. The Doctor isn’t tortured by it because he can’t remember it. He can’t remember anything, in fact: the solution to ‘too many continuity references’ isn’t just to edit them out, but to preclude them altogether. The Ancestor Cell resets him to the books’ 1997 factory setting: a blank slate eighth Doctor, one apparently Richards wants to reinvent from the ground up. The Burning is a pretty good re-launch: there’s a lot it gets right, introducing the Doctor as a mysterious and potentially dangerous outsider investigating a creature from the fires of the Earth in a north England town, much as the ‘ninth Doctor’ appears in Scream of the Shalka. He’s written, for the first time, as the ‘Byronic hero’ we were promised. And it’s a smart and deliberate move on Richards’ part to keep the Doctor vague and unknowable (even to himself) at this point, and for the next few books. He knows Paul McGann will soon be reprising the role and giving writers much more to build on than the TV movie. The Doctor’s amnesia is a ploy to buy them time to hear how he’ll play the part so they don’t seem to be at odds with the audios. But this is the nub of the books’ problem: now McGann is coming back, what are they for any more? Arguably, just telling stories is enough – more good Eighth Doctor Adventures were published in the second half of the range than the first. But there’s a reason why, in The Night of the Doctor, the eighth Doctor remembers Charley, C’rizz, Lucie, Tamsin and Molly, but not Sam, Fitz, Compassion, Anji and Trix. This is it. The Burning unmistakeably marks the moment when Peter Darvill-Evans’ vision of the novels pulling Doctor Who forwards is quietly abandoned, and Justin Richards concedes that they aren’t the main range any more. From now on, they’re second fiddle to Big Finish, which actually has the eighth Doctor himself appearing in new adventures.